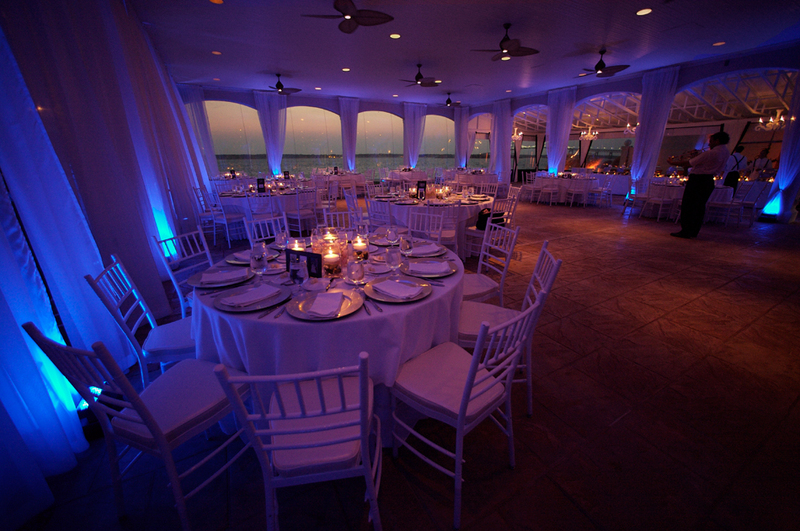 Indoors or out, we offer a large inventory of unique and creative lighting effects to illuminate any: room, tent, floor, wall, ceiling, statue, plant, flower arrangement, building facade, etc. Our new-generation, battery-powered, wireless Up-lighting can be placed discreetly anywhere. Without the restrictions of cords and need for electrical power, they can be discreetly placed anywhere to accentuate anything. Often used around the perimeter of a room, they cast a glow to the entire arena. We use them strategically to bring out the architectural elements of the room. Spot-lighting is another type of lighting that we often use to highlight the cake and flowers. In addition, we have a huge selection of static and moving effects that can project shapes, patterns, and anything your heart desires. Pricing for a typical lightscape begins at $1495.00. For multi-layered and multi-effect lighting installations we can customize packages. Ultimately, cost is dictated by the size of your room and the number of fixtures it requires to light properly. We are happy to work with any budget and can be accomodating with simple lighting requests, especially when booked along with our DJ services. We extend special pricing when several services are combined. I can’t stress the importance of proper lighting enough: dollar for dollar, lighting adds more impact to your decor than any other single element. Aside from my basic mantra that every light should be on a dimmer switch, the power of lighting should not be ignored. Don’t think of lighting in terms of “on” and “off,” instead, use lighting to highlight what your guests see and hide what should be hidden. Be sure there’s ambient light at your ceremony with enough light for the photographer and videographer to shoot what they need. Don’t spend money on centerpieces no one can see, use narrow spotlights called pin spots so the flowers pop like jewels. Talk to the DJ about adding moving intelligent lights over the dance floor to help start the party when it’s time to groove. And then there’s the gobo; a template inserted into a lighting fixture that projects an image of your choice when and where you want it. You can have one custom made with your initials or one with the motif that’s part of your wedding decor. You can find stock gobos in hundreds of patterns including leaves, stars, and stripes. They’re not only impactful, but also a design solution that lets you truly personalize any space; floors, walls, ceiling, or even the botom of a swimming pool. It can be projected on the aisle just before your wedding ceremony, light up the ceiling of your reception area or bring your dance floor alive.